Corkscrew is an immensely fun quilt with lots of wonderful movement. 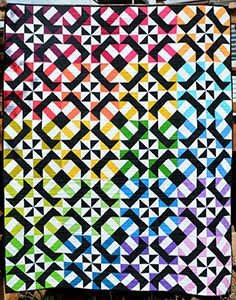 This block might look complex, but can be broken down to wonderful basic quilting elements that you will learn in class. The pattern includes fabric requirements for both a Fat Quarter print per block version or a scrappy version, so you can make the quilt that fits you best. So sign on up, we are going to have a great time!! The Corkscrew pattern offers 4 sizes. A baby size measures 54” x 54” and is comprised of 9 blocks. A lap size measures 54” x 72” and is comprised of 12 blocks. A twin size measures 72” x 90” and is comprises of 20 blocks. A queen size measures 90” x 90” and is comprised of 25 blocks. Pattern and/or Kit Fee: $5.00 for Pattern – Pattern will be available to purchase in class Any special rulers or equipment that will be needed.